Sous-verre or painting under glass was popular in Turkey in the 19th and early 20th centuries. At one time such paintings were to be found not only in houses, but in places of worship, coffeehouses, confectioners, butchers and barbers shops. When girls got married their trousseaus were not complete without a sous-verre painting. Yet today they have become a rarity, and the artists who made them have given up as their customers dwindled. Until 15 years ago it was still possible to find sous-verre paintings on sale in Istanbul, particularly in the Antiquarian Book Market. The artists worked in powder paint, water paint, gouache, oils, and in latter times even in acrylic. They worked on the back of the glass, adding the colours in layers, so that once one colour had been covered, retouching or alteration was impossible. The outline, details, signature and date were executed first, unlike an ordinary painting in which these come last. The artist then filled in the surfaces between the lines, and finally the background. Sous-verre painting was done on sheets of 2-3 mm thick glass, which had to be prepared so that the slippery glass would take the paint. Numerous different techniques were employed for this purpose, such as garlic in some European countries, and gum Arabic or other adhesives, diluted and applied with a brush were common. When the picture was completed it was backed with paper, cardboard, wood or paint to protect it. In Turkey painting under glass was mainly the preserve of untrained folk artists, who neglected to back their pictures, with the result that very few have survived. Different subjects were preferred for homes and work places. Pictures of Sahmeran, a creature half-human and half-serpent who was a symbol of wisdom, were generally hung in houses, in the belief that they brought good fortune and health. The serpent has been a symbol of womanhood, and hence fertility and abundance, in many places around the world. Another picture is the Seven Sleepers (Eshab-i Kehf) motif, a calligraphic composition in the form of a galley, which was believed to bring prosperity. This was commonly hung in shops and offices. At one time coffeehouses were Istanbul's art galleries, and naturally the pictures hung on the walls reflected the political and religious inclinations of the time. Favourite subjects included a scene from the Sahmeran myth about Zaloglu Rüstem's defeat of Sefik the giant, Sührab's battle with the seven-headed dragon, and the Iron Wrestler fighting the lion. Early sous-verre paintings were done singly by hand, but as their popularity rose, they began to be mass produced, so that many identical copies of the same painting were to be seen. As well as people who were artists by trade, glaziers also turned their hand to painting under glass. 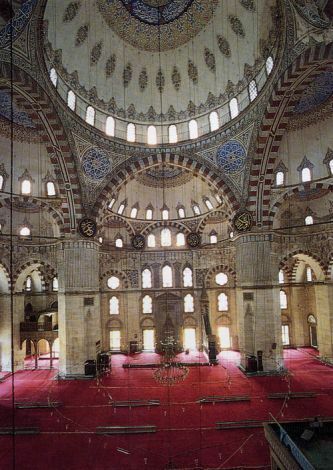 The majority of these paintings originate in Istanbul, because this was where Turkey's glass producers were situated. However, a second centre of production was the city of Konya, where there was also a tradition of calligraphy and painting, encouraged by the teaching of the Mevlevi dervish order, whose founder Mevlânâ Celaleddin Rumi lived here in the 14th century. The sous-verre paintings of Konya were for the most part in the form of calligraphic compositions incorporating the name of Mevlânâ. In eastern and southeastern Turkey, meanwhile, pictures were inspired by Shiite symbolism. Paintings with religious subjects included calligraphic inscriptions, calligraphic compositions (in the form of mosques, ewers, jugs, fruit, birds and medallions), and views of Mecca, Medina, mosques and the Hejaz railway. Another genre was based on folk tales and myths, and finally there were imperial armorial devices. The fragility of glass is one of the main reasons for the rarity of these delightful pictures, about whose anonymous artists very little is known. Some interesting examples can be seen at Topkapi Palace, and in the Museum of Divan Literature in Istanbul. There are also some of these pictures in private collections, such as those of Balkan Naci Islimyeli, Neveser Aksoy, Ömer Bortaçina, Sahin Paksoy and Hifzi Topuz. A handful of leading Turkish artists are now using the technique, including Mustafa Plevneli, Neveser Aksoy and Mevlut Akyildiz, so that it may be sous-verre is in for a revival.